"Cut The Rope" and "Pudding Monsters": "Cut The Rope: Experiments" ver. 1.4 now has "Superpowers" ! 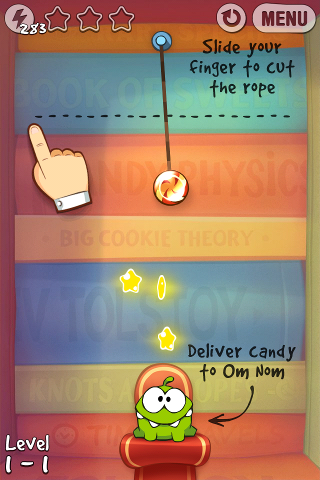 "Cut The Rope: Experiments" ver. 1.4 now has "Superpowers" ! 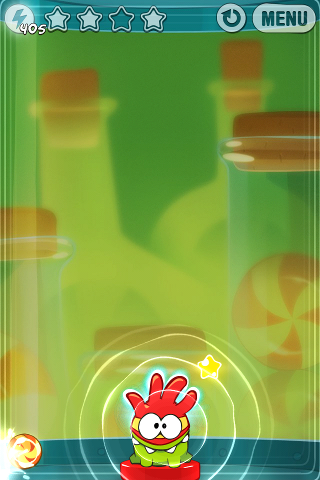 As you can see in the video above, when the "superpower" feature is activated, you can move the candy in all sorts of directions by tapping on the screen beside the candy and sliding your finger along. A "circular force field" is generated around the location where you tap and this can repel the candy away from it. One limitation is that you can only generate the "circular force field" in one location at a time. Although you can still perform other actions like cutting ropes, etc. while the "circular force field" is active, you cannot generate 2 such force fields simultaneously. This "superpower" feature is newly added in ver. 1.4 of "Cut The Rope: Experiments" and there's NO new box or level added. It's very similar to the "Space Eagle" feature of "Angry Birds Space" (a new popular game by "Rovio"). Its purpose is to help players clear levels faster and earn extra "blue" (hidden) stars in addition to the normal "yellow" stars (shown in screenshots below). When the "superpower" is activated, the candy becomes "unbreakable" (it's not afraid of spikes) and it won't go off-screen as it'll rebound from the edges of the screen. 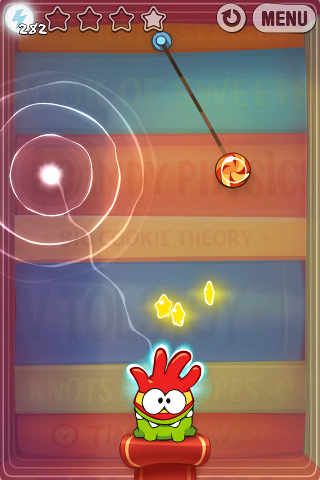 You use "telekinesis" to control the candy's movement, as shown in the demo video above. I show you a simple example. 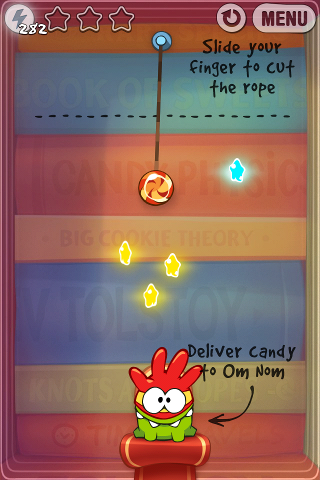 Above shows Level 1-1 of "Cut The Rope: Experiments" before activation of the "superpower". 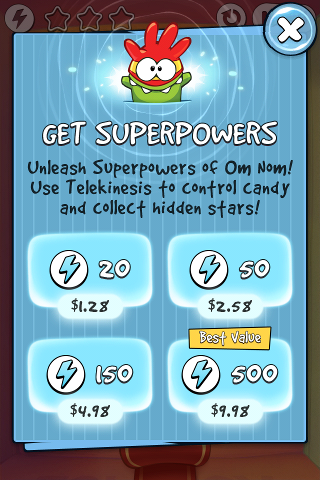 As shown above, when the "superpower" is activated, the appearance of Om Nom changes and a "blue" star appears. When you tap on the screen, a "circular force field" is generated at the location where you tap (as shown above) and this can repel the candy away from it. You make use of this new ability plus the normal tools/objects (ropes, bubbles, air cushions, etc.) to collect the "blue" star. 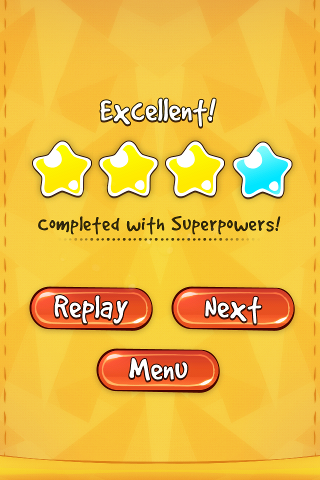 The score for the level is NOT affected when you use "superpower". 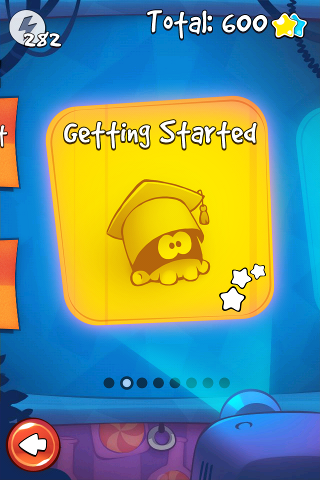 See the level completion screen above. If you've already collected the 3 "normal" stars for a level and you're only interested in collecting the extra "blue" star, then you only have to concentrate on collecting the "blue" star when you play. There's no need to collect any of the normal "yellow" stars in order the earn the extra "blue" star achievement (view next screenshot). The "Level Selection" screen will show the "blue" stars on the right side of the normal "yellow" stars for each level if you've managed to collect them. One complaint is that the top right corner only shows the number of "normal" stars collected. I think they may change this in future versions. 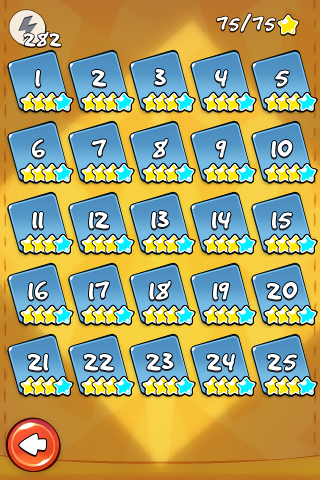 Unlike for the "Level Selection" screen, at the main menu, the "Total" counts the number of normal "yellow" + extra "blue" stars. I've collected ALL the stars. Now in ver. 1.4, there're 6 boxes of 25 levels each, so I have 6 x 25 x (3+1) = 600 stars. 1. If you still have some unused "superpowers" available but you don't intend to use any, then do not tap on the "lightning" icon at the top left corner of the screen unnecessarily because you CANNOT undo the activation. That means you would waste 1 use of them. You don't have to activate the "superpower" feature at the start of the level. You can activate it while playing halfway in a level. When the candy meets spikes or the edges of the screen, it'll rebound. If the candy has a rocket attached, its movement will be harder to control, but I find that it's quite easy to collect the extra "blue" stars for most of the levels. This is just an additional feature, it's not necessary to purchase it. Fantastic post, thanks for the detailed info about the superpower! Actually I feel that the pricing for this extra "superpower" feature is too expensive, but I had to purchase it so that I could write this article. Many users are not very happy about it and don't like the "pay-per-use" pricing model (read the comments in the Facebook page of "Cut The Rope" at http://www.facebook.com/cuttherope). Its pricing is very similar to the "Space Eagle" for the game "Angry Birds Space" (the 4th "Angry Birds" game after "Angry Birds", "Angry Birds Seasons" and "Angry Birds Rio") by game developer Rovio. Many "Angry Birds" fans are very angry and/or disappointed with Rovio regarding the "pay-per-use" pricing for the "Space Eagle" also. Most can accept the pricing for the earlier "Mighty Eagle" feature (for the 1st 3 "Angry Birds" games) which is very much cheaper (only a 1-time fee of US$0.99). Maybe ZeptoLab should have read the users' comments at the Rovio's website and the "Angry Birds" fan sites before choosing the same "pay-per-use" pricing model as the "Space Eagle". I want to follow this blog. I'm a huge fan of Cut the Rope. I love this game and Om Nom.